Keep a batch of this Homemade Pancake Mix in your pantry so you can have delicious buttermilk pancakes in a flash. Mornings are HECTIC in our house. We currently have a 25 minute drive right so we have to be up and out of the house early (but it’s ending next week, can I get a HALLELUJAH?!). That means our breakfast usually consists of cereal, scrambled eggs or a granola bar as we’re rushing out the door. My children are sloooow eaters so desperate times guys. At the beginning of the year I was all gung-ho about making and freezing all kinds of breakfast options so my kids could have something hot and filling without much effort in the morning. It was great. They could have pancakes, waffles, breakfast burritos in seconds. Well, it was great until we ran out and I didn’t make it a priority to restock the freezer. Life is hard and busy and sometimes things fall through the cracks. That’s where this Homemade Pancake Mix comes in. You can whip up this mix in minutes and have it on hand anytime the pancake craving strikes. There are 4 “batches” in this mix and each one makes 4 large pancakes so you’ll get 16 large pancakes out of the whole thing. For our family, one batch is the perfect size with some bacon and fruit on the side. I love that you can have this batter mixed up and ready to be cooked in about 10 minutes. Then a quick cook on the griddle and hot, fresh pancakes are ready. And they are the thickest, fluffiest, most delicious pancakes ever. I rarely make any other recipe. These pancakes do call for buttermilk which I realize isn’t always something we have in our refrigerator. But no worries because you can make your own with two very common ingredients. You’ll need milk (preferably 2% or whole) and white vinegar or lemon juice. Simply add a tablespoon of either white vinegar or lemon juice to a glass measuring cup. Then add milk until you reach the 1 cup line and stir. Let it sit for 5 minutes then add to the recipe as directed. It will curdle and that’s what you want so don’t be alarmed. There you have it friends. Go make a big batch of homemade pancakes to help make those mornings more successful. 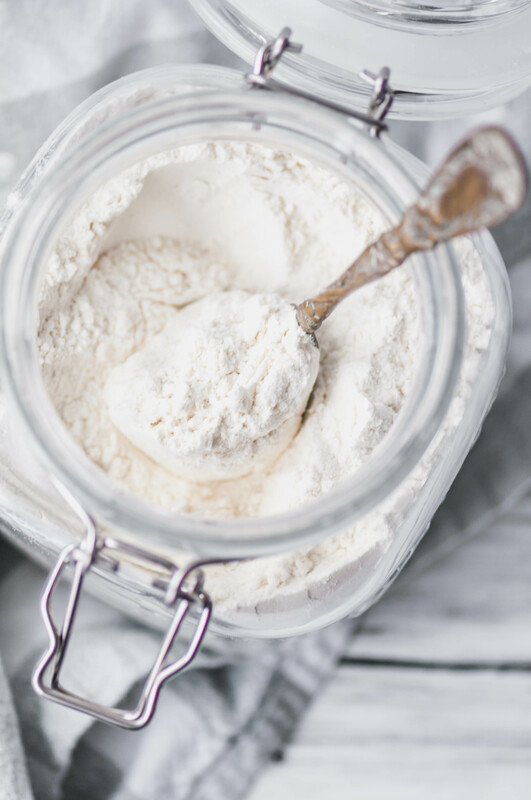 In a large bowl, mix together the flour, sugar, salt, baking soda and baking powder. Store in an airtight container at room temperature. To make the pancakes: mix together all ingredients and allow to sit for 5 to 10 minutes. Meanwhile, preheat a large skillet or griddle to medium heat. Spray with nonstick spray or coat with coconut oil. Using a 1/2 cup measure cup, scoop out batter onto hot griddle. Cook until bubbles form and sides start to set. Flip and cook until golden brown. Yields 4 large pancakes per 1 cup mix.